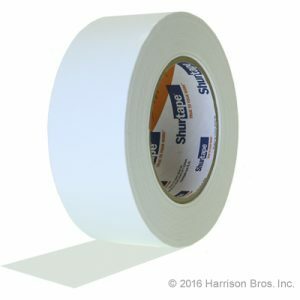 Shurtape P724 is a premium kraft paper tape with a synthetic rubber adhesive. It is one of the few tapes that can safely be used on wooden gym floors for temporary marking, if the floor is in good condition, causing no surface damage and leaving no adhesive residue when removed. The paper backing is smooth and is resistant to print through with felt tip markers. It has high edge tear resistance which means that it can stand up to shoe abuse and to activities that would cause other tapes to tear. It’s ease of unwind means that laying out long straight lines is simple to do. This product was originally marked under the Permacel brand, but has been a product made by Shurtape for many years. In addition to white, it is also available in black, green, orange, blue, yellow and red. It is available in multiple widths, including two inch, one inch, three quarter inch and half inch. Click here for Shurtape P724 specifications. Click here to purchase Shurtape P724.